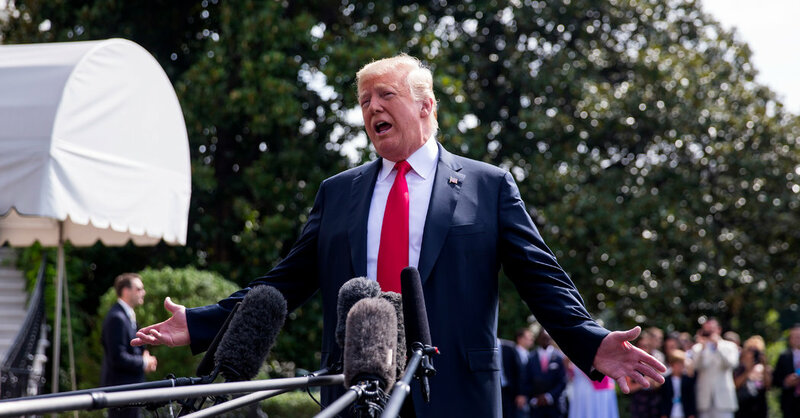 WASHINGTON — President Trump said he was not surprised that his onetime lawyer and fixer cooperated with prosecutors in exchange for a lesser punishment — “It’s called ‘flipping,’ and it almost ought to be illegal,” he said. “I know all about flipping. For 30, 40 years I have been watching flippers,” Mr. Trump said on Wednesday during an interview with “Fox & Friends” that aired on Thursday. The president’s professed experience with “flippers” illustrates his views on law and loyalty and helps to explain his opposing reactions to two men who are guilty of defrauding the federal government. The president’s former campaign chairman, Paul D. Manafort, who was just convicted of tax and bank fraud was “brave,” because he chose to go to trial instead of cooperating with the government. And Mr. Cohen, who was once so loyal to the president that he said he would take a bullet for him, was a bad lawyer who broke under pressure, in Mr. Trump’s view. “It’s called flipping, and it almost ought to be illegal,” Mr. Trump said of Mr. Cohen’s deal with the government. And the campaign finance crimes Mr. Cohen pleaded guilty to are “tiny ones,” or “not even crimes,” according to Mr. Trump. It was the latest swipe at the American justice system, which the president has previously disparaged and scolded for being unfair, most notably in continuing the investigation into Russia’s interference in the 2016 election and whether Moscow was coordinating with any Trump campaign aides. Flipping, or striking a plea bargain with prosecutors, is one of the most commonly used tactic in the federal justice system. “Plea bargaining is a defining, if not the defining, feature of the federal criminal justice system,” a 2011 Justice Department report on the subject said. The president said he often puts quotation marks around the word “justice” when he is talking about the United States Justice Department because, in his view, the department is not pursing the real crimes. As for the attorney general, Jeff Sessions: “What kind of man is this,” Mr. Trump asked in his Fox interview. The president has long expressed regret over naming Mr. Sessions to the post because he did protect the president from the Russia inquiry when he recused himself from overseeing the investigation. Mr. Trump said the only reason he gave Mr. Sessions the job is because he worked on his presidential campaign. “I felt loyalty,” Mr. Trump said.